I hope all is well. My name is Shane Breslin and I’m part of the Irish Cancer Society web team. I hope you don’t mind the unsolicited email but we’d love for you, as a respected Irish blogger and someone who has blogged about tobacco in the recent past, to be part of our first ever Google+ Hangout On Air on Thursday. This is a big week for the Irish Cancer Society. On Friday and Saturday we host our National Conference for Cancer Survivorship, our largest ever conference with more than 800 cancer survivors and healthcare professionals coming to the Aviva Stadium. But before that – and this is the bit that will hopefully involve you – on Thursday the Irish Cancer Society and the Irish Heart Foundation will jointly present new research showing how cigarette branding makes smoking more appealing to teens, and we thought you might be interested in taking part. Minister for Health Dr James Reilly announced earlier this year that Ireland would become the second country after Australia to adopt standardised packaging, which is also known as plain or generic packaging. This means that there will be no branding, fancy colouring or attractive cigarette pack designs any more. Our new research, which was carried out with 15-16-year-olds around Ireland, shows that standardised packaging would make them less likely to smoke. · Reactions to “plain packaging”. The research is being launched in Dublin on Thursday morning and we’d love to invite you to an online briefing at 3.15pm (Irish time) on Thursday afternoon, where we’ll explain a bit more about what it’s about and answer your questions about standardised or “plain” packaging. If you have any questions about standardised or plain packaging that you’d like to ask, feel free to send them on in advance and we’ll do our best to answer them on Thursday. · You’ll need to be signed into a Google account to access the Hangout On Air. This usually means a Gmail or YouTube account. Please let me know the email address you use to access any Google product. · You won’t need a webcam. While many Google+ Hangouts On Air take the form of video conferences, this one will be a webinar, with a presentation and text-chat communication. · Places in the Hangout are limited – as with all Google+ Hangouts On Air, the participant numbers are limited to 10, so please RSVP before 4pm on Wednesday if you’d like to be one of the attendees. · If you can’t make it on the day, or you don’t make it into the first 10, you can watch the webinar live on our YouTube channel at 3.15pm on Thursday, or watch it in its entirety on YouTube anytime from Thursday evening on. · Find out more about Google+ Hangouts On Air here. · This link, about Google+ Hangouts, should also give you some valuable information about system requirements – if you have an up to date computer, with a decent broadband connection and an up to date browser (we recommend Chrome) then you should be fine. · And finally, we look forward to welcoming you to this first ever Irish Cancer Society Hangout On Air! Minister Reilly was responding to a series of questions from the Sinn Fein health spokesman Caoimhghin O’Caolain……………………..
Government is looking after its own “insider pals” 30K pay hike for HSE boss! THE new HSE chief yesterday defended his €30,000 salary hike as Health Minister James Reilly signalled the Government should look again at public service pay. Tony O’Brien, who previously earned €165,000 as a health official, before taking over as Health Service Executive director general designate recently, is to be paid €195,000. Asked if it sent out the wrong message when he is overseeing €130m in health cuts, affecting many elderly and the disabled, Mr O’Brien said the salary figure was a matter for the Government and it was less than his predecessor earned. This is another well placed pal is been given a lottery salary and perks while the ordinary Joe is been fleeced, stripped of essential home care services and don’t mention A&E services .This is a blatant example of the out of touch politicians and their pals as they continue to dismantle the hard won health services every Irish citizen at one stage was entitled too . Now it is all about the haves and have not’s. Greed is alive and well and if you are with the “in” crowd you will be looked after and to hell with the rest of us. This Government is looking after its own insider pals and this will not be the last example I fear! As long as idiots continue to vote in such brazen gangster politicians they will continue to feather their own nests and that of their insider pals. The fun hasnt even started just wait for the water charges and the increased household charge(Irish poll tax) are forced through .I wonder who is going to get the top job in these new Quangos ?more that likely more pals of the gangsters in Government! On that note Big Phil has this message for you lads! Wake up Ireland, Get up off your knees and rid ourselves of the political élite who have robbed us of our country and whose greed has no bounds! 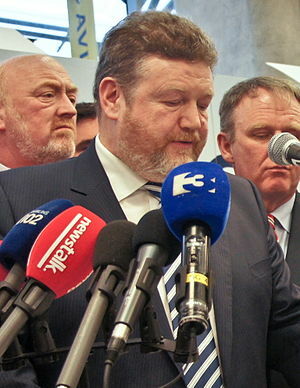 Last week James Reilly, the Minister for Health, got himself into hot water when his name was published in Stubbs Gazette for unpaid debts. He was part of a syndicate that invested in a nursing home to get tax relief. He put up £60,000 of his own money (about €76,000). There were 13 members in the syndicate and they raised about €2.25m to set up a nursing home. Apart from what they put in themselves, they borrowed €1.9m from Bank of Ireland. Five of the original investors, including Dr Reilly, agreed from the start to buy out the others. When they failed to pay they were taken to court, where they were ordered to pay up. With nothing paid, James Reilly’s name appeared in Stubbs Gazette. Remember “a salary of 250,000 for consultants in public hospitals in chicken feed”????? reaping benefits from insider information ! A phenomenon of the current financial crisis has been the colossal sums of money involved – the banks may cost us €70bn to bailout, we have an annual deficit of €18bn, our national debt is likely to peak over €200bn. For a country with a population of 4.6m, these numbers are truly gigantic. Indeed they are so big that we sometimes lose sight of what the numbers will mean to us individually or as communities. Having already suffered levies and charges to our wages, we have also seen cut-backs to services, and these look set to intensify. The closure of the Roscommon Accident and Emergency facility may have attracted a lot of headlines, but in truth there are 1,000 Roscommons coming down the track.